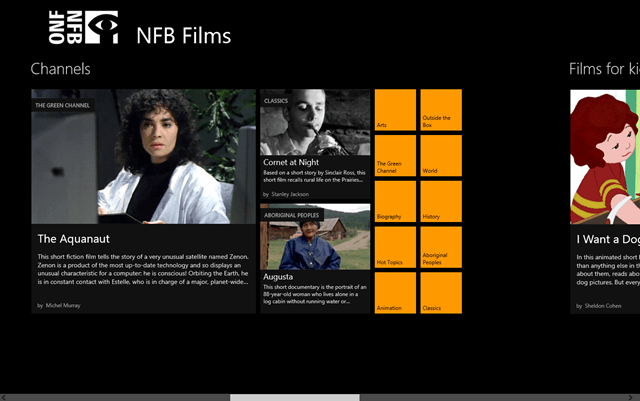 NFB Films is a free Windows 8 Movie App which will help you to browse through hundreds and thousands of online movies related to various genres. You can doodle around a number of online movies and documentaries with the help of NFB Films. 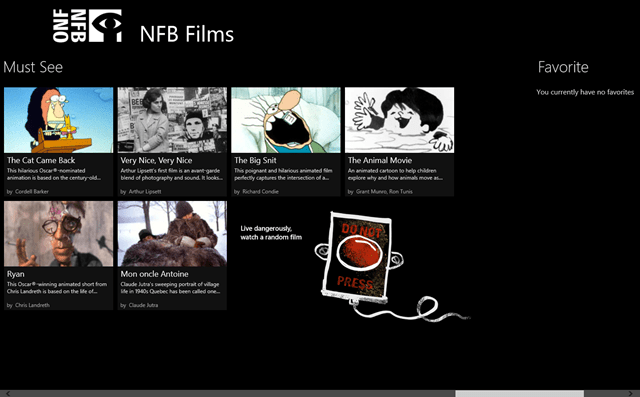 This movie app for Windows 8 will led you to hover around various short movies, animations, trailers provided by NFB Channel. There is a lot of things you can do with the help of this Windows 8 movie app. Just click on this amazing Windows 8 app and watch your favorite online movies on your tips. The featured films shown by NFB are the highly rated movies from their related genres, click on your favorite genre which you would like to relish and have a nice time watching it. You can also watch the New Releases on NFB Films app and also visit the Kids section where you can watch most viewed animated movies and short films based on your area of interest. It will just ask for your Internet access permission and you are good to go then. Watch the latest release and feed through this Windows 8 movie App. In addition, you can also browse through various channels based on various genres like Arts, Biography, History, Animation, Classic etc. And you can enjoy all these documentaries and movies just with a single click. The supporting video quality is also very noticeable and quite qualitative. There is also a catch in this app for Windows 8, like sometimes you don’t know which kind of movie you are interested in. So, you can hit this ‘DO NOT PRESS’ button to watch a random movie presented by NFB Films. 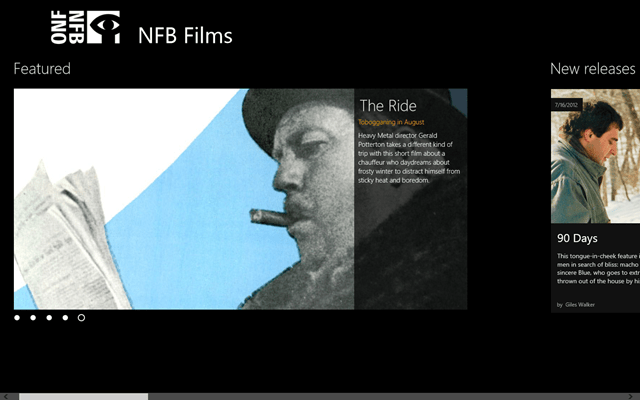 Just install this NFB Films app available under the ‘Music & Video’ category of Windows 8 store. You can relish a number of interesting and classic movies on your computer screen.